In the category of simple but amazingly functional is a new product set by AudioFetch. Any application that can benefit by personal audio feeds, will love these Wi-Fi broadcasting products! Entertainment venues, museums, house of worship – really anytime the listener would like to control their own volume level and source – AudioFetch can deliver. Simply purchase once of their audio processors and connect your audio source. 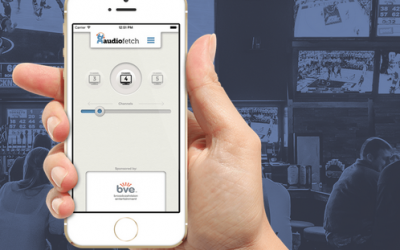 The AudioFetch device will encode the audio and deliver via Wi-Fi to any cell phone that is app enabled (Free via iTunes or the android app stores). The audio is broadcasted via multicasting so there is no limit to the number of simultaneous listeners. Encoding boxes with up to 64 inputs are available for multi-lingual or multi source applications (example: sports bar). EAR can help guide you through the various options and guarantee you’ll be thrilled with the results, happy listeners! Contact us today via chat, contact form, email or call 800-473-6914. More factory fresh details or get a quick quote today!